This delicious and lean burger will satisfy your taste buds beyond belief! The flavors of the meat are accentuated with a cool and refreshing avocado salsa. Fresh ingredients and lean meat are they keys, as well as a fresh toasted sesame seed bun. Mix meat, bread crumbs, Worcestershire sauce, liquid smoke and pepper very well. Shape into 3 patties of about 1/2″ thick. Let sit in fridge for about 15 minutes. a pinch of salt can be added if desired. In a separate bowl combine sliced avocado, chopped onion, cilantro, tomatoes and lemon juice. Mix well until all ingredients are well blended and it has a guacamole like consistency. Preheat your Foreman Grill for at least 5 minutes with the lid closed. Place burger patties on grill and close lid. Grill for approximately 5 minutes for medium doneness. After patties are done, place buns on grill but don’t close the lid. Let grill for about 1 minute. 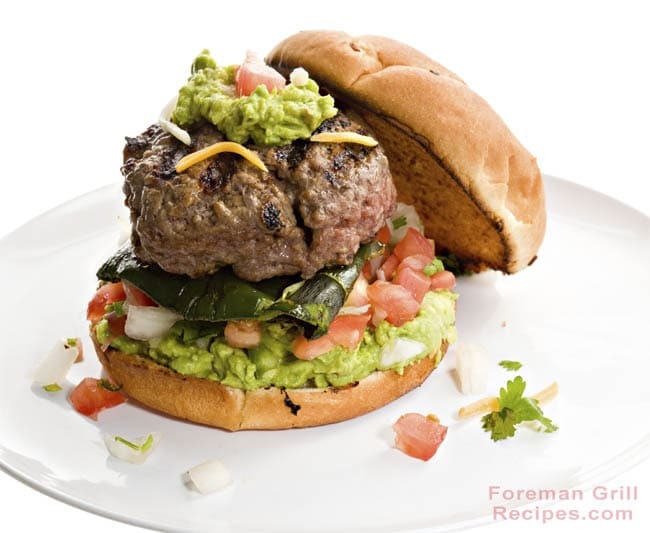 Add avocado spread to tops of burgers and serve warm. Add your favorite cheese if desired. why do they not tell the temperature to cook at just says preheated?